I describe myself as a fiscal conservative with a social conscience. Most of the time I discuss issues like slow economic growth and excessive national debt. But occasionally, like today, I deal with related issues such as social inequality. Last fall I had a post entitled, “Why Racism Exists in America” in which I made the case that it’s not just our different skin color which divides blacks and whites, but also the large degree of social inequality between the two races, such as disparities in family structure and education levels as well as for income levels. The suicide rate for black men has declined from 1999 to 2014, the only racial group to show such a drop. Births to black teenage mothers, who tend to have higher infant mortality rates, have dropped by 64% since 1995, faster than for whites. The rate of deaths by homicide for blacks decreased by 40% from 1995 to 2013, compared with a 28% drop for whites. The death rate from cancer fell by 29% for blacks over the same period, compared with 20% for whites. Smoking has declined faster for blacks than whites and, in fact, blacks now have lower smoking rates than whites. 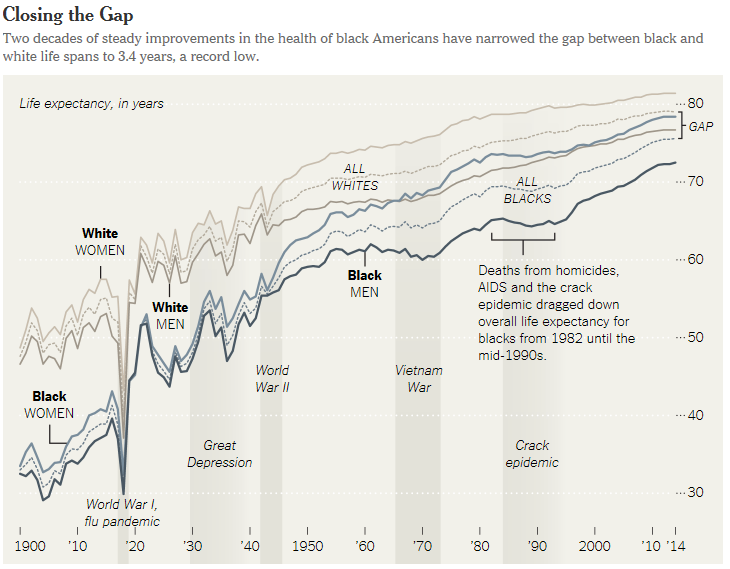 The decline in black deaths from AIDS accounts for a fifth of the narrowing of the mortality gap with whites from 1995 to 2013. One way that black lives matter is that blacks are living longer! This offers hope that blacks can and will make progress on other fronts as well. This entry was posted in Black Lives Matter, black poverty, black progress, black subculture, blacks, Jack Heidel, life expectancy, New York Times and tagged Black Lives Matter, jack heidel, life expectancy, life expectancy gap, New York Times by jackheidel. Bookmark the permalink.